One of the biggest mysteries of the 2012 season was what happened to Tim Lincecum. To date, I haven't heard an adequate explanation, so I've been trying to figure one out for quite some time. The pundits pointed to a decline in velocity as the main reason, opining that he was finally wearing out as a result of his unique pitching mechanics. Of course, a decline in velocity is more symptom than disease. Further, they made it sound like an inevitable and irreversible decline, but I have a hard time accepting that as being true. 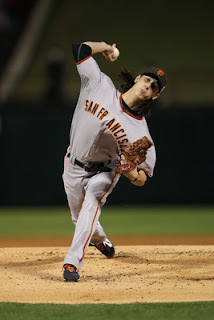 Lincecum's mechanics have always made some uneasy, he brought the kinetic chain to the masses. His mechanics demonstrated that you don't have to stand 6-5 with tree trunks for legs to be a legitimate and durable power pitcher. The kinetic chain allowed him to generate substantial force from minimal stature. And, while I've often wondered whether aging might rob him of the flexibility needed to effectively utilize his mechanics, I see no reason why the kinetic chain should falter as he heads into his age 28/29 season. But, if the problem isn't an inherent and inevitable flaw in the principles on which his mechanics were built, then what exactly IS it? Back in the day, I took a golf lesson from a teaching pro who was very good at what he did. And, part of what he did was to study outcomes and walk them all the way back to identify the swing problem. By focusing on how the results differed from what was intended, he could draw inferences about the nature and extent of the problem. For example, his fellow teaching pros would call him the Divot Doctor, because he would look at the direction and depth of the divot to determine the swing path and angle of attack. From there, he could identify the problem and determine how to correct it. Of course, he could also examine the height, shape, and distance of the shot, along with countless other outcomes of the swing, to identify the problem. After failing to find a single person who could actually pinpoint the reasons for Lincecum's troubles (granted, Dave Righetti probably [hopefully?] knows, but if so he's not running around espousing those views), I started trying to figure it out on my own. And, starting from the premise that the underlying principles of the kinetic chain remain sound, I started studying the outcomes and trying to walk them back to the underlying mechanical problem. In the end, I think I identified the problem, if not the reason for it. As mentioned above, the first hue-and-cry to be heard on Lincecum's struggles was that his velocity was down. So, that was the obvious starting point. Was he hurt? I wondered that until I watched his start on May 9, 2012, which was a typical and telling start. Lincecum's problem in 2012 was "the big inning." For whatever reason, he would frequently fall apart in a single inning, completely derailing any quality work that had come before. It wasn't all bad, all the time, it was more of a high wire act, occasionally impressive but with an inevitable tumble. The only question about his starts was when the tumble would happen. The May 9th game was no different. Lincecum cruised for the first 3 innings, striking out 6, walking 1, inducing one double play ball, and giving up 3 hits and 0 runs. Impressive, no? Even more impressive than the results was the process. The remarkable thing was that for the first 3 innings, he was crisp. He not only had his velocity back (fastball sitting 92/93/94), but his command was back (painting corners, avoiding middle of plate). Those three innings convinced me that the problem wasn't injury related. The next inning convinced me it was mechanical. The kinetic chain is about stacking force through a coordinated series of movements and efficiently imparting that force to the baseball. When the kinetic chain is unbroken, the pitcher reaps maximum benefits in performance. The performance of the pitch, whether (1) velocity, (2) movement, or (3) location, will be improved when the chain is unbroken. However, when the kinetic chain breaks, it can impact all three of those components of performance. 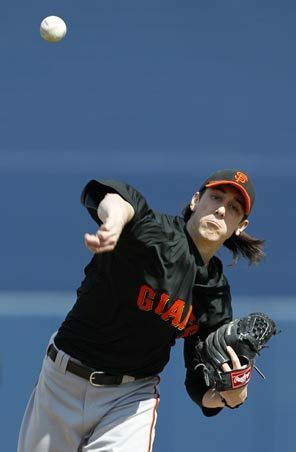 In the first three innings, Lincecum looked like his old self. In the fourth inning, he looked like a pitcher with a broken chain, complete with decline in velocity and loss of command. The other constant that I noticed with Lincecum in 2012 was that, during his big inning struggles, he frequently missed up-and-in with the fastball, brushing back right-handed hitters, and bounced his curve ball, uncorking 55-footers way off to the first base side of home plate. Not surprisingly, those pitches both made an appearance in the fourth inning. In the fourth, his command and velocity were gone, as a result he gave up a double, single, single, and a wild pitch to start things off. His fastball was slower, missing up-and-in, and he bounced 55-foot curveballs. When it was over, he had given up 4 runs, 4 hits, 1 walk, 1 wild pitch, and 1 strikeout. How could it all go so wrong, so fast? That's the obvious question. But, the question that was truly puzzling to me was how he could miss up-and-in with the fastball on one pitch, then down-and-away with the curveball on the next? Mistakes up-and-in AND down-and-away? That's the question that bothered me to the core, as the flaws seemed to be polar opposites. After thinking on it (a lot! ), I started focusing on the deceleration phase of the delivery. I have previously written about the early phases of the kinetic chain, focusing largely on generating force through each sequential move in the chain and then unleashing that force by efficiently imparting it to the baseball. I left out the deceleration phase for a couple of reasons: 1) there is more than enough to chew on with just the generating and imparting phases of the chain, and 2) there is one aspect of the deceleration phase that doesn't make intuitive sense to me. 1. The glove side remains firm out front. 2. The throwing shoulder must be closer to the plate than the glove side shoulder. 3. The arm must pronate and the earlier the better. 4. The pitcher needs to continue rotating around the front hip after release. The one part of the deceleration phase that doesn't make intuitive sense to me is the one that helped me understand Tim Lincecum's problem: number three on the list, pronation of the arm. The deceleration phase is very important to the health of the pitcher. During a pitch, the shoulder exceeds 7,000 degrees per second of internal rotation for adult pitchers, which is considered the fastest human movement and clearly requires a proper deceleration phase. Obviously, the stress placed on the arm is tremendous, creating substantial injury risk that's only exacerbated by any mechanical flaws in the delivery. Pronation of the arm is the rotation of the arm such that the surface of the palm is facing downward, which is the opposite of supination. This early rotation of the arm is designed to reduce stress on the elbow. Early pronation (or supination) of the arm dissipates the momentum of the arm more gradually, rather than the momentum slowing down by the banging of the elbow joint. Insufficient pronation (supination) of the arm is the equivalent of slamming on the brakes of the car every time you want to stop. The more often that happens, the sooner the brakes wear out. It's the same with a pitcher's elbow, as you want the pronation/supination of the arm, rather than the elbow joint, to dissipate the momentum. Ok, so early (i.e. immediately after releasing the ball) rotation of the arm is a big key to proper deceleration, but how does that help us with Lincecum's struggles? Well, in pitching, the arm rotates in different directions depending on the type of pitch thrown. For example, the arm pronates (i.e. 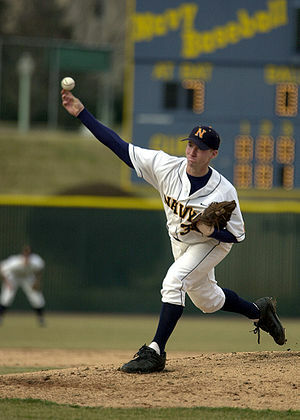 rotates counter-clockwise from the perspective of the pitcher) on fastballs, while the arm supinates (i.e. rotates clockwise from the perspective of the pitcher) on curveballs. On the curveball, pitchers either use supination completely throughout the deceleration phase or after their hand passes around the ball to generate the curveball spin their arm then moves back into pronation to decelerate the arm. Lincecum is actually the latter, so he pronates on the curveball as well, but he still starts with supination on his curveball. So, back to my original question: how could Lincecum miss up-and-in with the fastball on one pitch, then down-and-away with the curveball on the next? How can one flaw result in mistakes up-and-in AND down-and-away? Well, it seems clear that the above photos set forth the reason for the bouncing curveball and high-and-tight fastball. Lincecum suffered from one flaw, but it was obscured by the difference between pronation (fastballs missing up-and-in) and supination (curveballs bouncing short and to the first base side). Simply put, Tim Lincecum's flaw in 2012 was a slight lag in his pitching arm. Lincecum was able to pitch well for stretches, but inevitably the kinetic chain would break. If the arm lags behind, then the body's attempt to pull the arm along in the kinetic chain will exacerbate the effect of the pronation/supination of the arm. If the arm lags, then the coordinated movements of the body will be out of sync and the arm won't have the same snap in the delivery. The delivery will be inefficient, reducing the force generated. The shoulder rotation will begin before the arm is up in proper position, as a result the shoulder rotation will be farther along than normal when the pitching hand reaches the release point. Given that the shoulder rotation was farther along than normal when his pitching hand reached the release point, the rotation would naturally pull the arm towards the first base side. Such an effect would exacerbate the natural pitching arm action, be it supination or pronation. Consequently, if the shoulder rotation pulled the arm to the first base side on a curveball (supinate), then a bounced pitch to the first base side is the natural result. Further, if the rotation pulled the arm to the first base side on a fastball (pronate), then the natural result would be missing up and in to righthand hitters. In both instances, the pitching arm is unable to catch up to the upper body rotation, but the pitcher holds onto the curveball longer to finish the pitch, whereas the fastball leaves the hand sooner and is pushed up-and-in by the shoulder rotation and lagging pitching arm. While I think this explanation addresses most of the symptoms of his struggles, the reason why the struggles emerged is much more complicated. The problem that caused his struggles was that his arm lagged behind in his delivery. What I can't determine is the reason for the lag. I have two theories. First, his arm speed was simply diminished. Second, that he, in some way, altered his arm swing, increasing the distance his arm had to travel to reach the release point and causing his arm to lag behind his upper body rotation. As to the first, if the arm itself slowed down, then it would naturally lag behind the normal tempo of his delivery. If that's the case, then the follow-up question is whether that's reversible or permanent. One interesting aspect of Lincecum's struggles is the weight fluctuation that he has undergone over the last several offseasons. Two offseasons ago, Lincecum felt that added weight, in the form of increased muscle mass, would increase his durability and keep him strong later in the season. Despite a solid season, he wasn't happy with the added weight. As a result, last offseason he committed to dropping the weight. One viable theory is that he dropped too much weight, too quickly and that his strength suffered as a result. That could also explain his inconsistency, as the rapid weight loss could also have affected his stamina and balance. That could be a legitimate reason for a decrease in arm speed. If, on the other hand, the arm itself is simply not able to move as fast as did in previous seasons, then arm lag could be a permanent problem. But, in light of the fact that he has shown flashes of his old velocity and the lack of any evidence of injury, it seems unlikely to be permanent. As to the second, I don't see any indication that his arm-swing has changed. It's possible that it has, but given his flashes of good performance, it seems unlikely. It would seemingly require him to use one type of arm-swing during his good innings and another during his bad ones. In the end, Lincecum's struggles in the 2012 season seem related to a broken kinetic chain, causing him to lose velocity and command. The chain appeared to break due to a lagging arm, which prevented the shoulder rotation from properly pulling the arm around in the delivery. The tell-tale signs for me were the 55-foot curveball and high-and-tight fastball that popped up in his big innings. While the reason for the arm lag remain unclear, it seems like the type of problem that can be corrected. Hopefully, an offseason dedicated to rebuilding any lost strength and refining his mechanics can see him return to the pitcher he was prior to the 2012 season. The Cy Young seasons may not be coming back, but there's no reason he can't return to being the top flight pitcher he was in 2010 and 2011. I remain cautiously optimistic that the Freak can return to form in 2013. And, a quick follow-up, I just read a Keith Law blurb about Tim Lincecum's 3/13/13 spring training start. Law remains concerned about Lincecum's fastball velocity and command. Since it's an Insider Article I'll just quote relevant portion of Law's observation: "...although all I (Law) noticed was that his arm was a little late relative to his front leg compared to where it would have been two or three years ago." Obviously, that falls right in line with what I wrote above. Somewhat gratifying that a pundit reached the same conclusion, somewhat disappointing that it seems like a problem that will carry over into 2013 for Lincecum. Anyway, thought the blurb was worth a mention.